Its a feast: start with large juicy olives from our self serve counter, work your way through our wonderful pies and home-cooked hams and end your meal with a fantastic selection of cheeses, including local Barbers 1833 Cheddar, Dorset Blue Vinny, Applewood Smoked Flavour and Green's goats cheese. 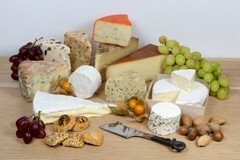 We stock Manchego from Spain, a semi-firm, full flavoured cheese made from sheeps milk. Lots of lovely local stuff! We bake a lot of our bread daily on the premises. 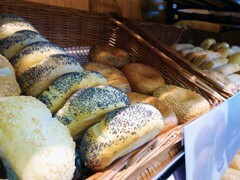 Choose from bloomers, baguettes, crusty rolls, as well as organic brown and white loaves. We have the family favourites of Warburtons, Hovis, Kingsmill, the rest comes from Somerset family bakers Mortimers, who deliver bread and cakes daily and Taylors of Bruton. Other local contributions come from Fudges (sweet and savoury biscuits), Victoria O'Brien (home-made cakes and pies) and Lavender Blue. 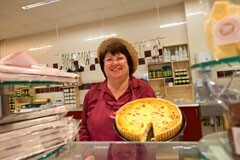 Stalbridge-based Oh So Sweet produce magnificent and very naughty puddings as well as scones for our cafe.